Fall is coming, and that means it's a great time to bring home a new tree. But before they do,homeowners should repeat the mantra"right plant, right place," according to Kari Houle, University of Illinois Extension horticulture educator. "If you have space for a tree that can only be 30 feet tall, don't chose a tree that is 50 feet tall and hope that you can keep it pruned 20 feet smaller," Houle says. "Determine how much space you have available andwhat yoursoil conditionsare,then find a tree that is suitable to that planting space." Even though fall is a great time of year to plant trees, there are some trees that are best planted in spring. According to Houle, the following treesare bestplanted in spring,as they are slower to root out. Before digging, Houle recommends making a utility line-marking request with 811 Chicago if you live in the city or JULIE everywhere else in Illinois.It's a free service, but requires a 48-hour minimum notice between submitting a request and beginning to dig. "Not only is it Illinois law to call before you begin digging, it is also for your safety and prevents disruption of utility services," she says. When ready to dig,Houle suggests digging a hole that is two to three times wider and not deeper than the root ball. 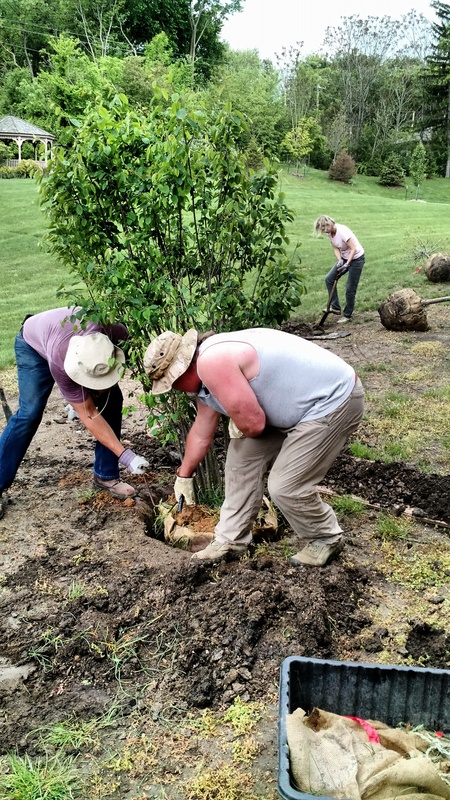 Digging a hole deeper and then filling it back in will only cause the soil to settle and, over time, can cause tree stress,girdling roots, early fall coloration, reduced growth rate, and can eventually lead to tree decline and death. "If by chance the tree has been grown too deeply in the pot, which can happen,you should examine your tree for that before you dig the hole," explains Houle. Remove excess soil from the tree until the basal root flare is exposed,then dig the planting hole.Inheavy clay or heavily compacted soils, Houle suggests planting the treea littlehigherby a few inchesto help with drainage and digging the hole three to four times wider than the root ball. When planting a burlappedtree, place it in the planting hole and remove all twine and the wire basket and burlap as far down as possible. Any burlap left above ground acts as a wick, removing water from the ground. If left intact, the twine can girdle and damage the tree. "When you go to backfill the planting hole, use the soil you dug up. There is no need to amend the soil," Houle says. "Amending the planting hole with organic matter doesn't encourage outward root growth." Once the tree is planted, water well every five to seven days, depending how fast the soil is drying out. "Checking soil moisture every few days is helpful to determine whether it's time to water. Using a soaker hose can make watering easier," she adds. 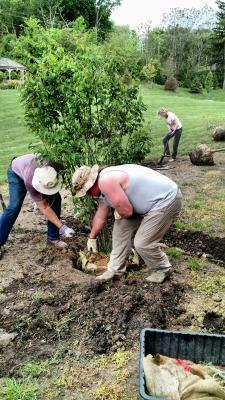 To further assist in helping reduce moisture loss from the root ball, mulching a newly planted tree, or any tree for that matter, can provide huge benefits to our trees.Mulch helps to reduce moisture loss, moderate soil temperatures, add organic matter back to the soil over time, and helps to prevent lawn mower and weed whip damage to the trunk of the tree. "Choose an organic mulch, such as cypress, hardwood shredded, arborist chips, or the like.Rock mulches don't provide the same benefits as organic based mulches do," Houle explains. Only stake trees in high traffic or windy areas. Most trees, especially smaller-diameter trees, often don't need to be staked. If they are, make sure to remove the staking material within a year after planting. Contact your local Extension office for information on proper staking and for additional information on trees and tree care.